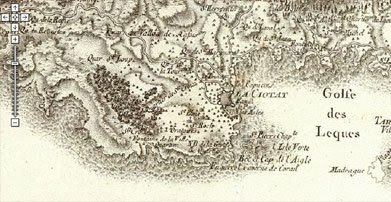 One of the landmarks in the history of map making is César-François Cassini's 18th century map of France. The 182 sheets of the map took Cassini over thirty years to complete. Thanks to GeoGarage you can now view all 182 sheets on their Cassini Map (dead link removed). The Cassini map of France has been added by GeoGarage as an overlay on top of the Google Map of France. This means you can now view the oldest map of France on a topographic scale using Google Map’s zoom and navigation tools. The transparency of the Cassini map overlay can be set at three different levels. Therefore you can compare Cassini’s map to contemporary France. For example, if you compare 18th century Paris to the present day Google Map of the city you can see how little the centre of Paris has changed in the last 250 years. Another very useful feature of the map is the ability to adjust the satellite layer. If you set the map to satellite view you can also adjust the transparency of the hybrid view. You can therefore view the Cassini layer with various transparencies of the Google satellite and map views underneath. The original images of the Cassini map have been provided to GeoGarage courtesy of The David Rumsey Map Collection. Many of David Rumsey’s maps can also be viewed in Google Earth. You can find them via the Gallery layer in Google Earth.